Not big of a deal, this error oftently occurs. It just means that some package referenced by a task sequence is not distributed to the distribution point. This should be an easy fix… well not in this case. When reading SMSTS.log we can find the problematic package ID. In this case KR100048 was the bad guy. First problem : the Size column is 0.00MB ?!? I immediately thought that I’ve probably forgot to distribute this package on my distribution point. Surprise, it’s distributed ! I immediately thought that I had not drank enough coffee… ok maybe not. I decided to go to my Task Sequence and disable the step that reference to this driver package. Launch a new test, reboot my VM… Boom ! Same error in SMSTS.log (Failed to resolve selected task sequence dependencies 0x80040104) … but on a different driver package. So I disabled this one too… and another, and another…*fast forward 15 min later*… I ended up disabling all my driver packages except for 2 that didn’t gave the error if I kept it enabled. Interesting. As I am a curious guy, I had to understand this one. So I next decided to check in the SCCM database the difference between all the “non working” and the “working” driver packages. 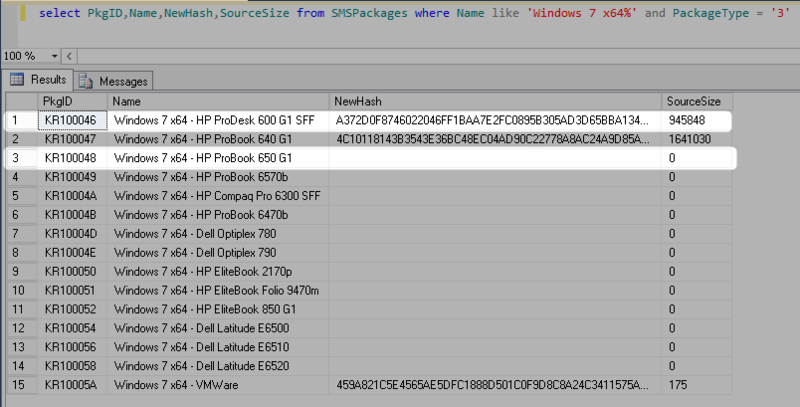 Some driver packages has no value in NewHash and SourceSize (explaining the 0MB size in the console). The ones with no value are the problematic one. I yet need to understand why some has values and other don’t as they’ve all been created the same way. I really doubt about the Update distribution points when finished check box so I decided to import a new driver and Check that box to see if the NewHash and SourceSize will be populated. Obviously, it’s not distributed as I haven’t choose any DP. So to resume, the NewHash and SourceSize is updated by the Update distribution points when finished check box from the import driver wizard or by the Update Content command from the console. 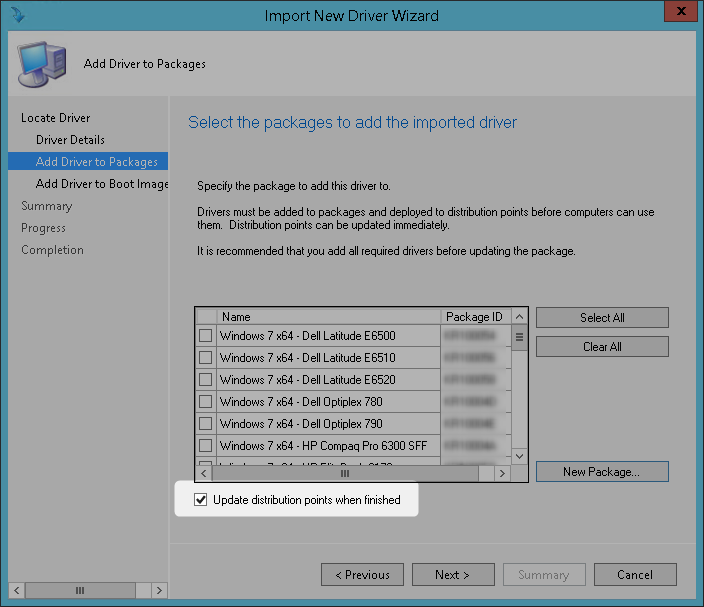 It’s mandatory to use one of both before using this driver package into a Task Sequence. A simple Distribute Content is not enough and your Task Sequence will fail. 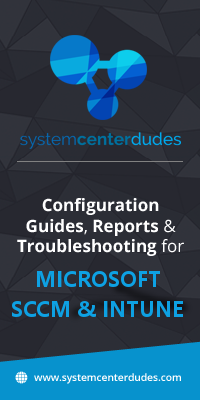 I have created a Connect feedback about this issue and update this post when I have something new to share. Fantastic! I blew up my database recently and had to restore, and re-import 90 gigs of Drivers. For some reason the task sequence no longer indicates which PkgID is not found, it just says that one of the packages is not found. Now i can see all the ones that are missing and stop my super slow process of elimination method. Thank you! 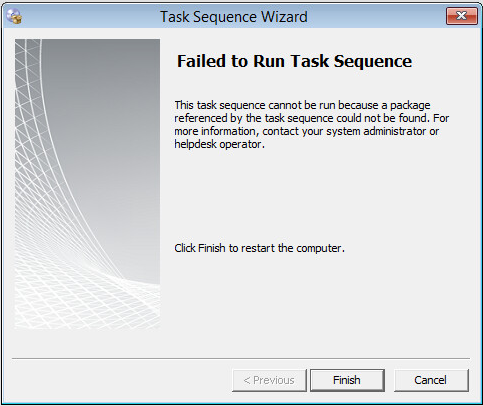 This happens frequently when exporting and importing task sequences with all dependencies. Our solution is to add something to the comments section of the driver package then update distribution points, that usually fixes it. OMG! I’ve been working on this issue for the last two hours! Thank you for the fix. Adding a comment and updating DPs worked for me! WTH!?? You can just add some info to the comments section of the driver package and redistribute, that fixes it too. we get it on SCCM 2012 SP1 when driver packages are imported from a full task sequence export. This happens for us as well. So I have been creating the package and adding it to DP’s then using tickbox during import.